As your local Allen Park dentist, one of my roles is to help you take care of your mouth. Sometimes mouth sores can be an issue, and while dentists often defer to an oral surgeon for extreme cases, we can help you make an assessment. If you live in the Detroit area and have a mouth sore that lasts more than a week or two; come and see us. Mouth sores can be an indicator of disease, and an early assessment is the best bet. A better understanding of your mouth sores can lead quickly to comfort and a resolution. If necessary, treatment and pain relief can be offered. 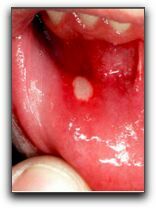 There are two types of mouth sores that are common; canker sores and cold sores. As your Allen Park dentist, we can’t do much to stop canker sores or cold sores in your mouth. We can discuss the health of your mouth, and examine any causes that make your mouth sore. In some cases a change in the way you care for your mouth can reduce the chances of getting mouth sores. If you are in the Allen Park, and would like to speak with a dental professional about mouth sores, area give us a call at Szalai & Szalai DDS.